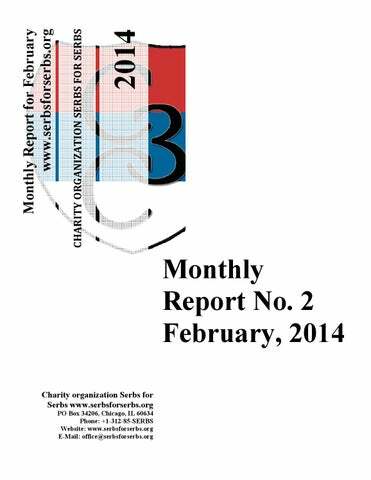 Monthly Report for February Dear friends and donors, Charity organization Serbs for Serbs registered in the state of Illinois in United States in Jun 2010 by the group of the Serbian youth. Charity organization Serbs for Serbs is a 501(c)(3) notfor-profit profit charitable organization. Donation is tax-deductible deductible to the extent followed by the law. On 30th September, 2011 we finally nally got the letter from department of the treasury (IRS) with tax exempt 501(c)3 approval. All donations to our organization donated from June 16, 2010 are tax deductible under section 170 of the Code. We are also qualified to receive tax deductible bequests, devises, transfers of gifts under section 2055, 2106 or 2522 of the Code. www.serbsforserbs.org 2014 the population and generally bad economic condition of the households in Serbia, Republic of Srpska and other countries in the Balkan. An average couple has "fallen" on one child. Analysts warn that Serbs will become a minority in its own country in the following century if the nation, individuals and government don't wake up from the nescient in which they've fallen! On the other hand, nobody is talking about the families with many children which grieve by living in bitter poverty. Occupied by their everyday struggle for survival, they are being humbly in their desire for implementing rights which belong to them. Their life stories, fears and problems are identical, but almost invisible and unheard in order to gain the attention of the public, media and even state. That's why the idea of the Charity organization Serbs for Serbs arose. The organization rganization was formed by a group gr of young and trustful people, who are united by the common vision of helping families blessed by many children and who are aware of the fact that even a small help means a lot for those who don't live in a material excess. We are united by the humane idea to help the poorest part of the Serbian nation. Charity organization Serbs for Serbs try to revive the spiritless energy of the Serbian Diaspora which would be able to reinforce people of Serbian heritage as well as all good people throughout the world ld with minimal, but bu constant monthly donations. We hope and believe that there is also a grain of doing good and that you will join us in the endless e struggle against poverty. God bless and save all Serbian families with many children and our honored donors who participate in the noble effort to return smile on children faces. www.serbsforserbs.org 2014 Who do we need in organization? We need members and donors that will secure financial stability through supporting our programs and activities in the future. Donors may join our daily activities within the organization in order to coordinate our work better. We also need volunteers ready to donate several hours per week for actual work within the organization. Activities of volunteers and their specific tasks would be determined by the required projects and their personal interest. From that group of volunteers we would look for future leaders of organization. Charity organization Serbs for Serbs from the Republic of Srpska delivered, within the Christmas action, a new help for family Malovic from Sokolac. The family consists of parents Drago and Kosa and their eleven children: Milkica (24), Nevena (23), who has a nine-month baby, BoĹžidar (19), Vladan (17), Radan (14), Jelena (13), Ljiljana (11), Mihajlo (9), Zeljana (7), Sandra (6) and Marina (4). SfS provided a washing machine, wood-burning stove, footwear and some food in the amount of 1.411 KM. Family Malovic moved into the new house, provided by the Ministry for family in cooperation with Sokolac municipality. The Ministry used to build such homes several years ago all over the Republic of Srpska for the mothers with four and more children. The houses are very good â&#x20AC;&#x201C; on the lower floor there are a living room with kitchen, a bedroom and a bathroom. On the upper floor there are three bedrooms and another bathroom. The houses are finished both in the inside and on the outside. The family has the tendencies of further growth, so a cow and a calf are more then welcomed in the forthcoming period. Should there be possibilities and the donations, the family would like to build a new home within the household. Charity organization Serbs for Serbs helped a twelvemember family Kostovic from the village Ljuljac near Novi Pazar, by providing a cow and a calf in the amount of 176.500 dinars. The family consists of grandparents, parents Dragi and Radovanka, and their children: Marina (19), Milos (18), Vesna (15), Radica (14), Miljan (7), Tanja (5), Ivan (4) and Danilo, who is six months old. In cooperation with the fraternity from the Djurdjevi Stupovi monastery, we provided a cow with calf for the family. We have helped the family several times before, by providing groceries, hygiene, footwear, clothing, baby food, diapers, washing machine and a lawnmower. We call upon all the donors and friends of the Charity organization Serbs for Serbs to support this and similar projects of our organization which will be conducted during 2014. Charity organization Serbs for Serbs, in the scope of the Christmas action of helping our people on Kosovo and Metohija, provided used connectors for tractor to the families who depend upon agriculture. During October last year we visited several families and agreed to buy the connectors. On this occasion we helped five families. The connectors we provided consisted of the following: tedders, two plows, a trailer and a water pump in the total amount of 259.000 dinars. Family Marinkovic, village Paralovo, tedders Members of family Marinkovic are parents Srdjan and Gordana with children Danijela (18), Kristina (17), Milena (16), Lidija (11). Members of family Simijonovic are Blagoje and Slavica, who have three sons Bojan, Goran and Marko and all of them are married and have one child for now. Bojan and Svetlana have a son David (2), Goran and Danijela have a son Aleksandar (1) and the youngest Marko have wife Sladjana and son Kristijan (4). Trailer for family Peric, village Izvor Family Peric from the village Izvor consists of Dragan and Trajanka and their four children: Dejan (15), Danijel (11), Kristina (7) and Irena (1). Jancic Mladen, village Prekovce, plow Near family Simijonovic lives a single mother Slavica Jancic with her two children: Andjela (17) and Mladen (15). In the village Zebince, for the family of Zivojin and Ana Kostic and their children Tijana (9), Mihajlo (7), Aleksandar (5) and Danica (3) we provided water pump with pipes. We use this opportunity to thank our friends from the Charity organization Majka devet Jugovica, who helped us to deliver all the connectors to the endangered Serbian families on Kosovo and Metohija. Father Srecko up until recently was employed in the industrial facility in Skopje. He managed to build the walls of the house, buy a tractor on loan and provide elementary living conditions for his children. However, his firm went bankrupt, and he lost his job. After selling the cow, the family didn't have enough money for equipping the house. We provided new front door and two windows for the family. In the new action in Old Serbia, Charity organization Serbs for Serbs helped families Petrovic and Guskin from Kuceviste and family Bravo from Skopje, whom we visited during last year. The total amount of help was 2.000 â&#x201A;Ź. With the help of Center Spona in Skopje, we provided joinery installation on the rebuilt part of the house. For the three pupils from the Guskin family we provided a computer. The rest of the money was used for the medical care and medicine for one of the family members. A seven-member family Bravo received the means for the heating during the winter. Charity organization Serbs for Serbs in the partnership with Spona has conducted its actions to the families in Old Serbia two years ago, and it will be continued in the forthcoming period. The first of those actions was conducted within the Christmas action. The last action of help was conducted before Easter, and the money raised for this area was 2.000 â&#x201A;Ź. Family Guskin, summer 2013. Lenka and Zlatko Guskin have three children: Nikola (15), Aleksandar (13) and Ivana (9). We provided a new computer for them, and the rest of the money will be used for Lenka's treatments in Belgrade. Family Petrovic, summer 2013. The first two families live in the majority Serbian village Kuceviste. Family of Srecko and Ljiljana Petrovic has four children: Anastasija (7), Svetlana (3), Petar (6) and Kristijan (eight and a half months). The last family we visited was the family of priest Simeon and his wife Angelina Bravo, who have five children: Jovan (19), Marija (16), Ana (14), Grigorije (12) and Teofanija (10). Father Simeon is a priest within the Ohrid Archbishopric, which is functioning in Macedonia as the Christianity in the first centuries, except that the catacombs are replaced with apartments and houses. Family Bravo is under a great pressure. The children are being harassed by their teachers and pupils. The family is facing with big utility bills, so we provided money in order to prevent cutting electricity and water to this endangered family. Charity organization Serbs for Serbs helped family Sestic from Banija (village Komogovina) within the big Christmas action in Krajina. Members of the family are father Djuka, his wife Ljubica, and their children Milica (10), Milos (8) and Radovan (6). Radovan, Milica and Milos Sestic are the only children in the village Komogovina. They live next to the monastery Komogovina. The whole family is doing agriculture, and their life is very difficult. The children don't have beds and mattresses, and they can only dream of computer. We helped the family by providing construction material for the adaptation of the house in the amount of 700 â&#x201A;Ź. We call upon all the donors worldwide to continue supporting the projects of the organization Serbs for Serbs in order for help to reach the vast number of endangered families across Balkan. After almost a year, charity pancake party has been organized in Thun in the organization of the organization Serbs for Serbs from Switzerland and the restaurant St端rredli. The guests came from Zurich, Geneva, San Galen and Fribourg, which gave us great joy, bearing in mind the distance and bad weather conditions, which didn't stop them from coming and supporting our work. We raised a total of 1.260 CHF, which would be used for the regular activities of our organization. Children are our future! We prepared more than 300 pancakes! We owe special thank to Mica and Mira, the owners of the restaurant, as well as all the guests who support us regularly. On Sunday February 16, a three-member team of the Charity organization Serbs for Serbs from Belgrade visited, with the friends of the association Ravnica Srpska from Subotica, family Pejic from Gornji Tavankut near Subotica. The family consists of father Stevan, mother Milena, daughter Milica, sons Slobodan, Miroslav and Nemanja. Within the project â&#x20AC;&#x17E;Trojka iz blokaâ&#x20AC;&#x153;, the competition took place in Subotica at the end of last year, and we raised 148.830 dinars for building a bathroom for family Pejic. As a result of the competition, we built and equipped bathroom in the total amount of 210.600 dinars. Old bathroom of family Pejic Family Pejic came from Bjelovar after the war in Croatia. The sons work only during the season in the neighboring farms. The oldest son Slobodan has a wife and a child, but they live in Belgrade at her parents' due to bad existential conditions. The works on the bathroom encompassed: damming of the room, placing electric and pluming installations and setting the bathroom tiles and sanitary elements, as well as building the cesspit. Apart from that, we built one part of the kitchen. New kitchen of family Pejic We use this opportunity to thank the construction firm Gradjevinar Peric from Donji Tavankut, which performed construction works and donated 35.000 dinars through the material and work. We also thank the association Ravnica Srpska, and a vast number of donors and sponsors from Subotica, who enabled us to finish this project. Family Djilas consists of two brothers with their wives, children and mother. Nedjo and Maja Djilas have sons Mihajlo (4) and Sasa (2). Obrad and Marija Djilas have children Olja (15) and Stefan (13). Older brother Obrad is the only employed in the bakery, while the rest of them work during the season for a wage. The existing roof is in bad condition, so we decided to provide construction material for them to resolve that problem. Charity organization Serbs for Serbs in the scope of the big Christmas action helped several families in Krajina, among whom were the families Djilas and Djomlija from Kistanje. We provided construction material for family Djilas, for the reconstruction of the roof in the amount of 900 â&#x201A;Ź, while family Djomlija received baby food, package of groceries and hygiene, and firewood in the amount of 300 â&#x201A;Ź. Family Djomlija with SFS help Parents Radovan and Danijela Djomlija have a son Nikola. They returned to Kistanje a few years ago, and now they are renting a place where they live. We provided firewood, baby equipment and a package of groceries and hygiene. Charity organization Serbs for Serbs continued building a house for the six-member family Pudar from the village Bun near Mostar. On this occasion, they received electricity and the plumbing installations in the amount of 1.400 KM. The next segment of works will include plastering, insulation, installation of gypsum board in the roof, laminate and tiles. You can see the progress of works in the photo report. The brotherhood of the Ostrog monastery started an action of helping the family. The works on building a new house were continued, and the children received the money for the transportation to the school. Father Predrag is a hard-working person, but he fails to provide elementary conditions for his family. With the blessing of the archbishop Amfilohije, Charity organization Serbs for Serbs, together with the brotherhood of the Ostrog monastery commenced a big charity action for finishing the building of the family home for Predrag and Svetlana Dragojevic from the village Martinici near Podgorica. The house in which the family currently lives is in very bad condition. The floors are devastated, and each has several big holes. The walls are snapped, and the roof could collapse. Serbs for Serbs Report February 2014.